home with young children and noticed they had nothing for the children for Christmas. Mike began the program working with a handful of other firefighters in the basement of his home. 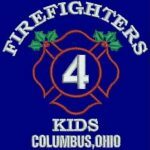 In the beginning , the toys that were provided were often used toys or new toys that Columbus firefighters had donated to be delivered to families in need. As the needs in the community grew, and as more people got involved, the program was able to expand and begin to assist more children during the holiday season. The organization has a very strong volunteer community and relies on it to work the program. At no time has anyone that is a part of the program received a salary, and that continues to be the standard today. The program provides toys for children ages 0-12, and if they have items available, provide gifts for children ages 13-14.